But what about Super numbers? Over the period you have chosen to analyse there were 31,000 fewer working age beneficiaries and I agree. that can only be good news (albeit the decrease may mainly involve short-term dependants and reflect economic conditions rather than welfare reforms. Hard to know now the longevity reporting has changed.) But there were 79,000 more superannuitants. When is National going to address this problem? I don't see Super in the same light as a benefit for a number of reasons. However it's still a debit on government revenue which is growing every year, faster than any decrease in the working age welfare bill. Eligibility for the very first Old Age pension was set at 65. It's madness to ignore how different 65 year-olds of today are. Key's obstinence over this matter is one of his few electoral vulnerabilities. 17,000 fewer on benefits - welfare reform or economic conditions? Latest benefit numbers reveal thousands of New Zealanders have gained financial independence by coming off welfare in the past 12 months, Social Development Minister Paula Bennett says. 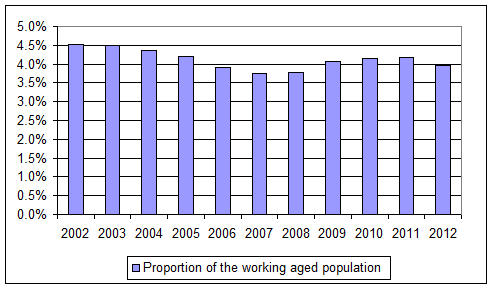 Figures for the December 2013 quarter released today show over 17,000 fewer people are on benefit compared to December 2012. “This is a significant decrease and proof that the welfare reforms implemented by this Government are making a huge difference for New Zealanders,” Mrs Bennett said. 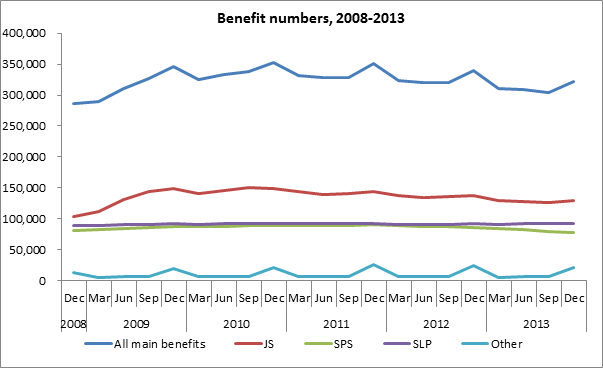 Main benefit numbers increased substantially between December 2008 and December 2012, though they have fallen from their peak in 2010. The main driver for this pattern has been changes in economic conditions. I'm inclined to agree that economic conditions are the greater influence. The categories of benefit changed in July 2013 and the earlier numbers have been adjusted accordingly. I'd like to see the chart go back further to ascertain whether the prior pattern also reflected the economy (in the absence of any meaningful reforms under Labour). “The decrease includes over 8,000 sole parents who have gone off the benefit, a 9.4 per cent drop compared to the same time last year,” Mrs Bennett says. Welfare reforms included new obligations for sole parents to be ready and available for part-time work when their youngest child is school-age and full-time work when their youngest turns 14. Yes, sole parent beneficiary numbers have dropped by 9.4 percent, but they did this during the 2003-07 period too. So as much as I want the reforms to make a difference, it is probably too soon to tell. HOWEVER there is one factor that would lend support to the Minister's claim which she should probably be drawing attention to. The number of people who are long-term dependants (over 1 year by this government's definition) has fallen as a percentage of all beneficiaries. At December 2012 the percentage was 70.5% ; at December 2013 the figure was 69.4%. (Those numbers relate only to the current benefit spell). In real terms between Dec 2012 and Dec 2013 there were 15,755 fewer long-term beneficiaries but only 1,471 fewer short-term beneficiaries. I've also looked at Sept quarter figures because the Dec figures are distorted by an influx of students. But I'd like to see data relating to those dependent for 4 or more years but those stats are no longer provided. The graph below, from the latest Taylor Fry valuation of beneficiary liability, shows the age of entry into the benefit system for those beneficiaries aged 30-39 at June 2013. For a long time I tried to get this information out of MSD but the limitations of their data prevented a certain outcome. However I could get enough to suggest that somewhwere between a third and a half of people on the DPB began on welfare as teenagers. That was disputed by people like Susan St John (see below). The reason 30-39 year-olds are depicted here is that older data is not available (ie the full benefit history of 40+ idividuals is unknown). Almost two thirds of current 30-39 year-old beneficiaries began on welfare aged 19 or under; three quarters aged 24 or under. Stunning. 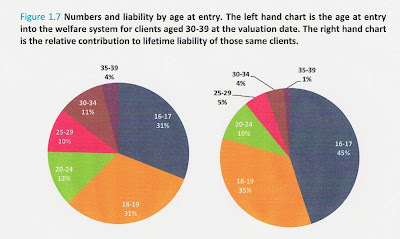 This information clearly shows why it is so important to stop young people entering the benefit system from the outset. Lindsay Mitchell (NZ Herald letters, 15th June) claims that Ministry of Social Development data shows that at last a third of current DPB recipients began on welfare as teenagers. She then goes on to suggest, with no supporting data, that the actual percentage may possibly be twice that. This is designed to make us believe that New Zealand has an enormous problem of sole parents starting young and being on the benefit for years. This Bogey may justify all kinds of draconian knee jerk responses. In fact MSD says that, of the 34,000 DPB recipients aged 29 and under who had any time on a benefit as a teenager, only 17% (5,780 people) received the DPB, and the others may have had a minimal stint on unemployment or sickness benefit long before they had children. Thus only 6% of current DPBs started as teenagers. It is a gross exaggeration to describe this as a huge dependency problem. The data clearly shows that sole parents largely move off the benefit when suitable jobs are available and when the needs of their children allow them to. The hand-ringing over sole parents should be replaced with community respect for the difficult lonely and yet vital work they do in caring for their children. RNZ asked me to comment on Paula Bennett's release today heralding the drop in beneficiary liability due to the welfare reforms. "Of the $10.3 billion reduction in liability[ii], $4.4 billion is due to Work and Income actively exceeding expectations by getting more people off benefit for longer, and less people coming onto benefit," says Mrs Bennett. I had the luxury of half an hour to look at the numbers but concluded I'd have to take them on good faith. Future projections concerning so many people and so many variables are always going to be debatable. For example, some of the drop is due to CPI forecasts coming in lower than predicted. But it's conceivable that a small drop in the percentage of beneficiaries can equate to a much larger drop in the percentage of projected liability (13 percent between June 2012 and June 2013). This is because some beneficiaries will use welfare for much longer than others. The reforms have targeted those people. While the government is happy to claim responsibility for the improvement on their reform programme, other factors are also at play. The falling teenage birth rate, improving economy and falling youth unemployment. In any event I have always believed the focus of the reforms - youth and sole parents - is the correct one. If the actuarial indications showing these reforms having a positive impact are sound, that can only be good. Went to Hong Kong, Macau and China. Countries, their people and political systems, become far more interesting when experienced firsthand. Retrospective rambling accounts are not necessarily interesting for those who weren't there. So just a few observations. Our teenagers - 15 and 19 - did not want to come home. New Zealand's merits, for example, space and clean air, do not compensate for the internationalism, excitement, variety, customer service, efficiency and fascination Hong Kong offers. As do Macau and Shenzhen to lesser degrees. But at that age, their priorities are understandable. The same guide had just fathered his second child and was expecting to pay US$1,200 by way of a penalty (and I'm not talking child support). But he explained that his rural-born status meant his fine would be less than that of others who could face much steeper penalties. He cited a local celebrity facing millions. Perhaps a progressive tax? There didn't appear to be any particular rancour about this. A bigger point of complaint was losing money on Shenzhen's stock exchange. The border we crossed between the New Territories and China is an ugly affair. A glass-enclosed corridor between two stations crosses over a brown canal-like ditch with barbed wire on either side. The initial impressions of China are slightly depressing but quickly improve. The (gr)immigration officials are very stern but otherwise efficient. Below their panelled window is a facility to press buttons rating their service. Going in, we pressed the left-most button for the 'best' rating. But coming back my daughter got confused and again pressed the left-most button, this time though delivering a 'poor' rating. She was mortified at her mistake not wanting to cause the young Chinese female official any bother. Two Australian teenage boys had pressed the poor button on purpose and thought Sam was a great source of amusement for being so concerned over her mistake. Sam and I tried to figure out squat toilets. Mentally. Not physically. In Macau we put our lives in the hands of a hustling cab driver. We christened him Brian for reasons that I won't explain because they are racist. Well, maybe I will. Brian is the name we give to every stereotypically bad Asian driver we encounter in NZ. This trip gave us greater insights into that phenomena. They do not hail from Hong Kong where the driving is excellent - assertive but accommodating. In Hong Kong they drive on the right. In China they drive on the left. That might explain something. But Brian was a godsend. Drove us around Macau and managed to manage us with very little English. We paid him at the end of our day-trip, and, as I had discovered through our conversations, he was duly off to a casino to lose it. That was his daily routine. Macau is the new Vegas and I couldn't do justice to describing the bizarre spectacle. Massive hotel casinos are looming up in the smog everywhere interspersed with development sites, cranes, and temporary facades. Hong Kong in winter is hotter than NZ this summer. In Wellington anyway. If we wanted to live in a comparable suburb of Hong Kong to Eastbourne (eg Stanley) we would pay 7-8 times the value of our 5 bedroom house for a two bedroom apartment, probably with no view. Otherwise the cost of living is lower. Taxis and buses are affordable. We used both and marvelled at the low fares. Food is cheaper. Loyal to NZ wine, I was buying Oyster Bay sauvignon at 7 Eleven at less than the NZ price. Kowloon Buddhist monks are graspy rip-off artists. Perhaps this is a misconception on my part based on the monk's misconception of my behaviour. I dropped some money in his collection bowl intending to walk on, but was subjected to the preliminaries of a blessing, with a bracelet pushed over my wrist then told I must pay $100HK. He wasn't taking no for an answer and I wasn't paying it. It got a tad physical. Quite unpleasant. Not that $100 HK would have broken the bank but I would rather give it to the lady with the burnt face and no hands. Avoid Kowloon if desperate beggars bother you. At one point I decided to not buy stuff I didn't need from street markets and give away the savings. I filled my pocket with change and then didn't see another. So perhaps not as prolific after all. Air NZ is a great airline. Compatriot service companies should take a leaf out of their book. Great to be home but we returned with a reluctance. The bittersweet sign of a great holiday.